It was a strange sight: four people carrying a sleek, brown coffin as they lead approximately 70 black-clad students and professors in a procession along the Pierce College Mall Wednesday afternoon. This sight marked “Education is Dead!”, the third education-focused rally on campus, which was organized by a number of clubs with the purpose of raising awareness of and encouraging action toward the severe budget cuts directed toward community colleges. The rally would have resembled a funeral march if not for intermittent chants of “They say cut back, we say fight back” accompanied by the rhythmic beating of snare percussions. The accompanying hollow sarcophagus, which had a slit and the word “RAGE” stenciled on the cover, was built by a member of one of the student organizations in charge of the event. Following a short march along the Mall, the group congregated in the Great Hall, where participants signed petitions and shared their thoughts on the effects of the grim financial situation on California community colleges. Assistant Professor of Sociology James McKeever, one of the event’s organizers, spoke about his personal experiences with the community college system. McKeever also encouraged students to take action other ways, such as writing to state politicians and lobbyists, signing petitions, and voting for the right people. After his brief spiel, McKeever opened the floor for anybody who wanted to share their thoughts on the issue. “I should have been gone [to the protests] last semester,” said sociology major Jessica Flores. Afterward, Drooms, a band comprised of Pierce students, performed for the remaining protestors. “It could’ve been better,” said sociology major Ruben Garcia, 20, member of Resisting Against Gutting Education (RAGE), an informal campus club in charge of the rally. In addition to RAGE, Pierce clubs Students Organizing for Success, the Sociology Club, and Black Student Union participated in the march. The next stop of the “education coffin tour” is Los Angeles Valley College. 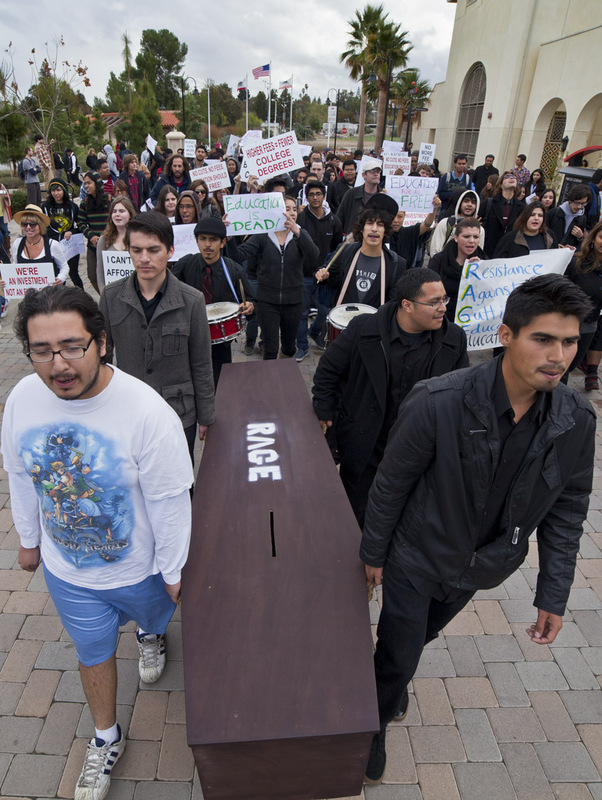 After the coffin is passed onto other participating community colleges and universities, it will be brought to Sacramento and used to lobby state government officials.